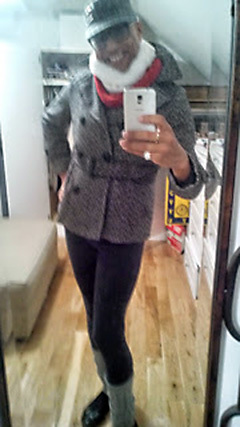 Femulate Contributing Editor Susan King of Transitioning into Tomorrow fame joins us again with her collection of coats. Fall is here. It's time to pull out the fall and winter clothing. I love this time of year because the clothes cover up more of my male attributes and creates a slimmer silhouette. A must for this time of years is a set of coats. In 2014/2015, I bought three nice coats and I cannot wait to wear them again. I am going to look for one or two new coats this season. 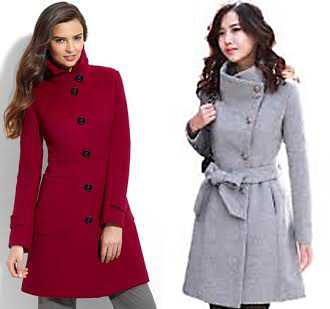 Below is an infographic about woman coats and which coat type to wear with your outfit. Here are my three current coats. 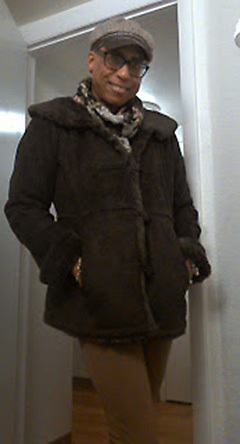 I bought this brown coat with the fur collar while in New Jersey. I forgot to pack one and forget how cold it was in Jersey versus Atlanta. I found this coat at the local goodwill store. This is my pea coat. I love this coat. It's so cute and works with my leggings. I bought it at Burlington Coat Factory. I bought this coat while trying to find a pea coat. I liked the style and it's hooded. 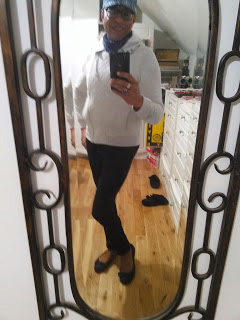 The light color allows me to wear this coat with different color leggings that I cannot wear with my brown and white/black pea coat. This season, I am looking for a full-length coat.